Inspired from Danish graphic paintings from the 50’s and 60’s, with strong, playful and sculptured shapes, the “ZOOF Chair gives Modern Danish Design a new meaning”. It was shown as a prototype at the TENT London fair in September 2011, and received a lot of attention. 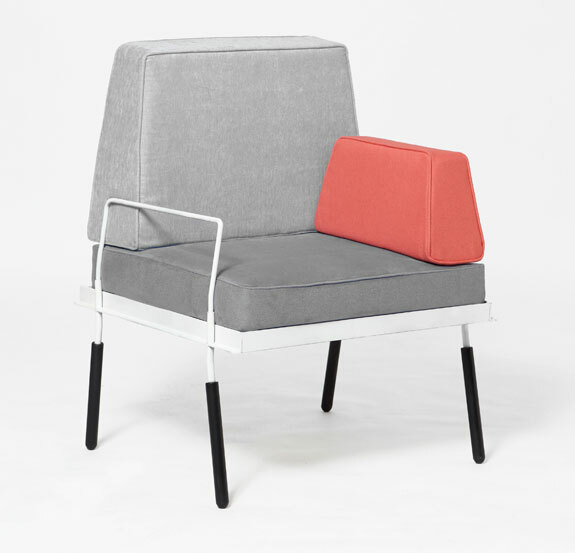 The chair is based on a metal frame, with loose cushions in different fabrics. The legs, back and side frames are removable for easy transport. The upholstered armrest, in the shape of a bar of gold, is to be placed in both sides depending on where the person want to rest his arm. For pricing and additional information, contact La Vague Dorée. Update 2018: The company ceased its activities and their products are no longer available.